INTROL CF Panel II Control is intended for in vitro use as a quality control to monitor analytical performance of the extraction, amplification and detection steps of test systems used in the qualitative measurement of the Cystic Fibrosis Transmembrane Conductance Regulator (CFTR) gene. This product is intended to be extracted and analyzed routinely with each cystic fibrosis (CF) test run. INTROL CF Panel II is designed to monitor the detection of 54 CFTR mutations, genetic risk factors associated with cystic fibrosis, including the 23 mutations recommended for testing by ACMG and ACOG. INTROL CF Panel II Control also monitors variants I506V, I507V, F508C, 5/7/9/11T and I148T. 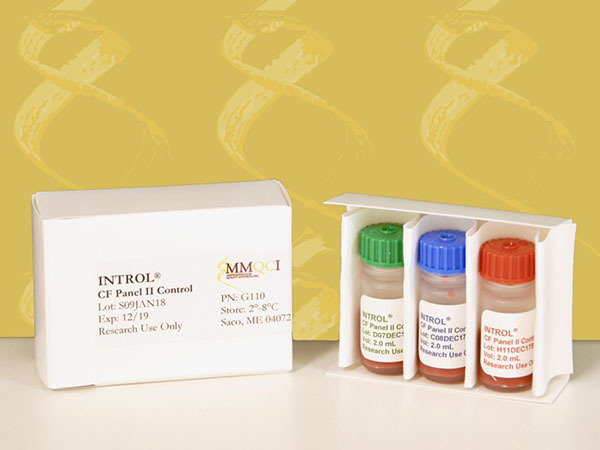 INTROL CF Panel II is provided for Research Use Only (RUO).